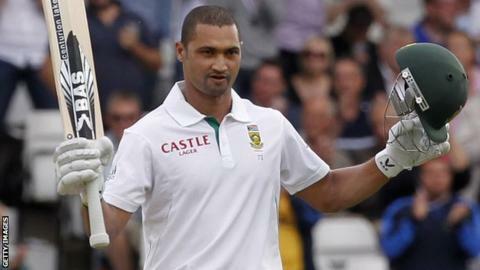 Alviro Petersen struck an unbeaten 124 as South Africa closed day one of the second Test on 262-5 at Headingley. After taking only two wickets in their innings defeat in the first Test, England dropped Petersen on 29 and had Graeme Smith caught off what was deemed a dead ball in a dispiriting, wicketless morning. Smith fell for 52 to end an opening stand of 120, while Hashim Amla (nine) and Jacques Kallis (19) for once fell cheaply. After a rain delay, Petersen completed his fourth Test hundred, adding 97 with AB de Villiers (47), but two late wickets with the new ball gave England hope. The three afternoon wickets and two in the evening represented something of a recovery by England, who had endured a wretched first session, having opted to field on a bright day in Leeds. "There has been so much talk since the Oval Test about how England are going to get rid of Smith, Amla, Kallis etc, but Petersen is the man who has held the innings together. Those two late wickets will cheer England up a bit. Not to get a wicket in the morning was a blow. They've clawed a bit back but I still put South Africa on top." A morning of surprises began when Graeme Swann was left out for the first time in a Test since the tour of the West Indies in spring 2009, while it was also the first time since 2003 that England had not selected a front-line spinner in a Test match. That was at this ground against the same opposition and resulted in a defeat by 191 runs - and the first session indicated that a loss on a similar scale might be on the cards. In the 11th over, James Anderson induced a regulation edge from Petersen, but Alastair Cook, fielding at second slip in Swann's absence, could not get his hands into a comfortable position and the chance went to ground, to the very obvious dismay of the bowler, who kicked at the turf. The exasperation grew in the next over when the recalled Steven Finn had Smith expertly caught by Andrew Strauss diving to his left at first slip for six, only for umpire Steve Davis to decide that Finn knocking into the stumps with his knee during the delivery should constitute a dead ball. That had former Test cricketers on the BBC's Test Match Special struggling to recollect any such previous incident and seasoned observers scrambling for the rule books, before Law 23.4 (b) (vi) was unearthed to somewhat vindicate the umpire's decision. Smith had already mentioned Finn's habit of knocking off the bails to the Australian official, with the law stating that any distraction to the batsman should make the delivery void. Petersen, who made a duck at The Oval, dominated the strike and unsurprisingly the scoring, too, making 50 of the first 60. With Finn seemingly unsettled by the earlier controversy his metronomic line began to elude him, as Smith, effective if not aesthetic, was able to punch through the off-side for consecutive boundaries to bring up the hundred partnership. "Either umpire shall call and signal Dead ball when the striker is distracted by any noise or movement or in any other way while he is preparing to receive, or receiving a delivery. This shall apply whether the source of the distraction is within the game or outside it. The ball shall not count as one of the over." The tall paceman was appreciably quicker than the other seamers, however, and he energised the crowd with a rapid bouncer that Smith needed to be alert to avoid. Smith remained and completed his 33rd Test half century from 91 balls, but, with things looking a shade forlorn, local favourite Tim Bresnan found some swing in the increasingly overcast conditions and the obdurate left-hander clipped off his pads to Ian Bell, who took a smart catch at backward square leg. Burly Yorkshire seamer Bresnan then grabbed a surprise second wicket. Amla, the elegant triple centurion from the first Test at The Oval, hesitated with Petersen in pursuit of a third run and was comfortably caught short of his ground by Bresnan's powerful throw from the boundary. In his 154th Test, Kallis was hardly unsettled by the comparative flurry of wickets and struck three imperious early boundaries, a straight drive down the ground off Bresnan prompting a chorus of approval throughout the crowd. The gathering clouds gave the bowlers some encouragement, however, and another prize scalp was collected, Kallis flashing a cut at Anderson and Cook taking a far more difficult chance than the one he missed, sharply and low to his right. As the skies lifted after the rain delay and the final stages were played out in pleasant sunshine, the batsmen looked in command again, though Finn thought he had removed Petersen lbw with the new ball, only for the decision to be overturned on review. Broad made a late breakthrough as De Villiers edged on to his stumps, while Finn shattered the stumps of night-watchman Dale Steyn. Can Taylor solve England's problems at number six? Read more on Can Taylor solve England's problems at number six?